Sports Costs > How Much Does Bowling Cost? The cost to bowl will be based on the number of games you bowl, how many people are in your group, or the total amount of time spent bowling. Most bowling alleys also offer league play for all ages, in addition to bowling lessons for individuals and instructional leagues for small children. How much does it cost to go bowling? On average, plan on spending anywhere from $1 to $4.50 per game of bowling on an average day. Keep in mind that many bowling alleys have designated times when anyone is allowed to come in and bowl, commonly referred to as “open bowling.” If there are leagues going on, there is a good chance that the lanes will be filled and you will be unable to play. Refer to our table below to see what the most popular bowling alley franchises cost per game. On special nights such as a cosmic bowling night, the rates can be slightly higher at $4 to $7 per game, or in some cases, the bowling alley may charge by the hour. If you call the bowling alley in your area, they will be more than happy to give you a quote for the night. Sometimes, it may be listed on the official website as well. If the bowling alley charges by the hour, plan on spending anywhere from $17 to $29 per hour to play. During this hour, you can play as many games as you wish. For example, Collier Lanes located in Michigan charges $1.50 to as much as $3.50 per game. They also have $7 all you can bowl specials after 9 p.m. If you want to bowl by the hour, the prices can be as high as $20 per hour. Corporate bowling alleys such as AMF charge as much as $5 per game. As noted online, they tend to be on the higher end for bowling alleys. If you would like to bowl on a league that offers competitive weekly play, the price will be a bit higher than open bowling. These leagues are put together in different ways, but almost all of them will have some type of prize for the winner or winning team. These bowling leagues for adults can range from $10-$20 per week and run for 12-15 weeks; bowling leagues for children will be $6-$10 per week and run for 8-10 weeks. AMF As little as $2 per game to $13+ for unlimited bowling. It will depend on the time of year, day of week and location. Brunswick $3 to $8+ per game, depending on same factors. Upon arrival, you will have to reserve a lane at the desk. Once reserved, you will receive your lane number and your shoes if you rent them. If you do not have your own bowling ball, the alley will have many you can choose for and won’t be considered an additional cost. Most bowling alleys have automated scoring that will automatically keep scores as each player bowls. Bowling alleys can also have full-service restaurants that serve typical bar food and alcoholic beverages, free Wi-Fi, an arcade, laser tag, an on-site pro shop, billiards and more. Higher-end bowling alleys may also have a wait staff that comes around to take food and drink orders. The typical game generally takes up to 30 minutes to complete with a party of three to four. If you did not bring bowling shoes, the alley will require you rent shoes from them. Bowling shoe rentals can cost anywhere from $2 to $5 for the night. If you forgot to bring socks with you, these can cost an additional $1 to $3 for a pair. Try to call ahead of time before going in. As mentioned earlier, if there are leagues going on, there’s a good chance that the bowling alley will be at full capacity. If it’s busy, some bowling alleys will accept reservations. “Cosmic bowling” refers to bowling that usually takes place late at night in the dark. The balls usually glow in the dark and the lanes are lit with black light. Check your local paper and coupon books to see if you can find any sort of coupons. Many bowling alleys will locally advertise for buy one, get free games and more. Deal websites such as Groupon.com often have great deals for bowling across your state. Most bowling alleys will have special nights where you can bowl for as little as a dollar. These deals are often on Monday, Tuesday or a random weekday night. You can also find some great deals during the summer when bowling alleys are slow. Try to find out when these days are and try your best to bowl on those days. 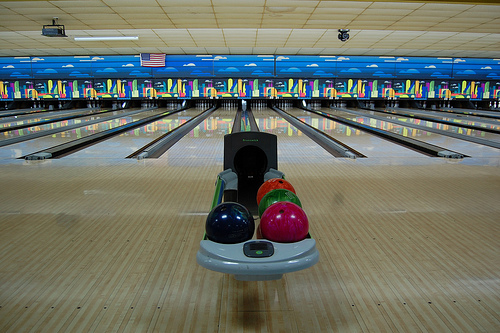 Some bowling alleys, especially during the summer, offer an “all you can bowl” pass, where you can come in and bowl as much as you want for a set duration.